Food for the soul. Every culture has at least one dish that feeds more than just the body and I think this one of them. These are the dishes that we turn to when we need a lift, just can’t cope, or simply need a treat! In my first few years as a new teacher, I had some rough days. I would drag myself home and turn to the kitchen for solace. I would crank up the tunes, grab a good glass of wine and pull out the pots and pans. The food that I created in that stressful period transported me from the drama of my classroom and mollified me. The next day I was good as new and ready to attack whatever crisis came my way! My roommate at the time loved this dish! She was so excited to come home to our suite and catch a whiff of peanuts, coconut and ginger! When I told her about my blog she reminded me of it and insisted that I should include it. So here it is – thanks for the good idea, Sharon! She came for dinner just the other day and I made it for old time’s sake. Well, time marches on and I am happy to report that this recipe is still as comforting as I remember it to be – it still feeds my soul! I hope you enjoy it too! In a food processor, process the ginger, garlic and curry paste until smooth. Add 1/3 cup of the coconut milk and process until all the ingredients are blended. Place the chicken in a bowl and cover with the above mixture. Marinate for at least 30 minutes in the refrigerator. It is better if you marinate it overnight. While the chicken is marinating, steam the broccoli until just tender. Place in a heated dish. In a wok, heat the oil and sauté the onions until golden. Add the marinated chicken with the marinade and quickly sauté until the chicken is browned. Add the remaining ingredients. Stir to coat the chicken well. Continue to cook until a thick sauce has formed and the chicken is tender. Check the flavor and season with salt to taste. Lift the chicken pieces out of the sauce and place on the bed of greens. Pour the sauce over top and serve. Sprinkle with chopped cilantro and green onions. I suggest serving with a big bowl of Thai Jasmine rice or over a lovely pilaf like I have done here. Place rice, water and salt in a medium saucepan. Bring to a boil. Turn heat to low and simmer, covered for 15 minutes. Remove from heat and fluff with a fork. In a small skillet, sauté the shallots in the butter, until golden. Add the garlic and continue cooking just until the garlic becomes fragrant. Remove from the heat. Place the rice in a medium bowl. Add the shallot mixture and toss. Add the pineapple tidbits and green onions and toss to incorporate. 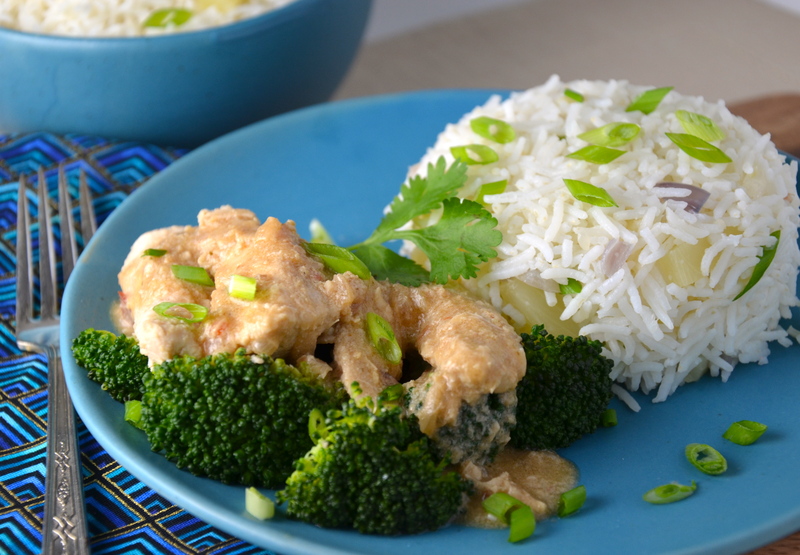 Serve as an accompaniment to the Peanut Chicken and enjoy! Ah yes! I do know those grey and gloomy days and this will fix you right up! If you can find a fresh pineapple it would be even more soulful than the canned tidbits that I used. Thanks so much for taking the time to comment! Cheers! I love your photos as well. Looking forward to your new posts. 😉 Have a safe and lovely day! Hey Jhuls, I’m glad you like the pics. It’s fun and certainly a work in progress! I have been cruising through your blog and it is wonderful. I have to tell you that I think you are a creative cook :-)! Absolutely my pleasure! Looking forward to following your beautiful blog!! Pineapple rice? wow that’s unique. I’ve never made rice with pineapple but I love peanut sauce. It’s one of my favourites! Hey Liz! From what I know of your taste, I’d bet you will love the pineapple rice! If not, well the peanut sauce is a real winner!